As Fatah and Hamas promote their reconciliation efforts and as signs indicating that the Islamic Jihad may be warming up to the idea of joining the Palestine Liberation Organization become more evident, the Palestinian Authority seems to be taking a harsher stand vis-à-vis Israel. PLO Executive Committee Member Hanan Ashrawi said Monday that the PLO may choose to revoke its recognition of Israel "should all other (political) avenues fail." In an interview with the Voice of Palestine radio station, Ashrawi stressed that while the possibility has yet to be discussed by the PLO, it was nonetheless considered as a viable option by the Palestinian leadership. Commenting on contested Israeli policies, she said that first option the Palestinians must exhaust was to file grievances against Israel with international bodies over issues such as settlement expansion. Ashrawi added that the PA must "devise a plan that would bolster the resilience of the residents of east Jerusalem," in view of what she called "Israel's Judaization plans"; and that the PA should pursue legal recourse against Israel on an international level, over its "prolonged violations of international law." She also voices her support for continued peaceful resistance, the likes of the weekly protest rallies in the West Bank against the construction of the security fence. Ashrawi's statement echoed a similar sentiment expressed by Fatah Executive Committee Member Muhammad Ashtiyeh, who last week said: "If Netanyahu insists on treating Tel Aviv and Har Homa the same way, we will treat Ramallah and Jaffa the same." Ashtiyeh protested what he called the "unbalanced" agreement between the PLO and Israel, reiterating the Palestinian demand that Israel recognize the 1967 borders as Palestinian territory. The escalation in the Palestinian may stem from the end of the three-month period given to Israel and the Palestinian Authority by the Quartet to submit it with reports detailing their stance on security and borders. The Palestinians have submitted their demands, but Israel has yet to do so. The final deadline in January 26. Palestinian Foreign Minister Riyad al-Malki said that the Mideast Quartet is close to failing in bringing Israel and the Palestinians back to the negotiating table. He added that other nations should join the mediation efforts, the likes of Brazil, Turkey, China, India and other Western countries. Al-Malki noted that the Palestinian Authority is considering applying to the UN General Assembly as a nonmember state, thus making it easier for the PA to join other international bodies, including the International Court of Justice. Meanwhile. 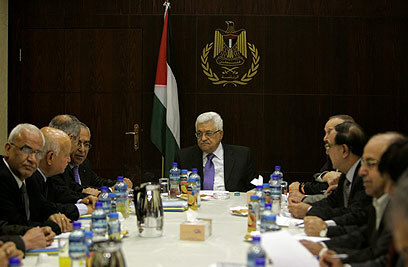 Palestinian President Mahmoud Abbas met Monday with members of the Palestinian "Reform and Change" movement, which is affiliated with Hamas. See all talkbacks "'PLO might revoke recognition of Israel'"